A few days ago the weather was chilly but dry, so we went for a walk at Spring Lake in the Abbott Marshlands. The holidays are over, but woodland shrubs there are still decorated with garlands of Wild Yam (Dioscorea villosa). This vine isn’t much of an attention-getter during the growing season, although it has lovely glossy, deeply veined heart-shaped leaves. It has male and female flowers on separate plants, but both are pretty inconspicuous. I always notice this plant in winter, much less often in summer. 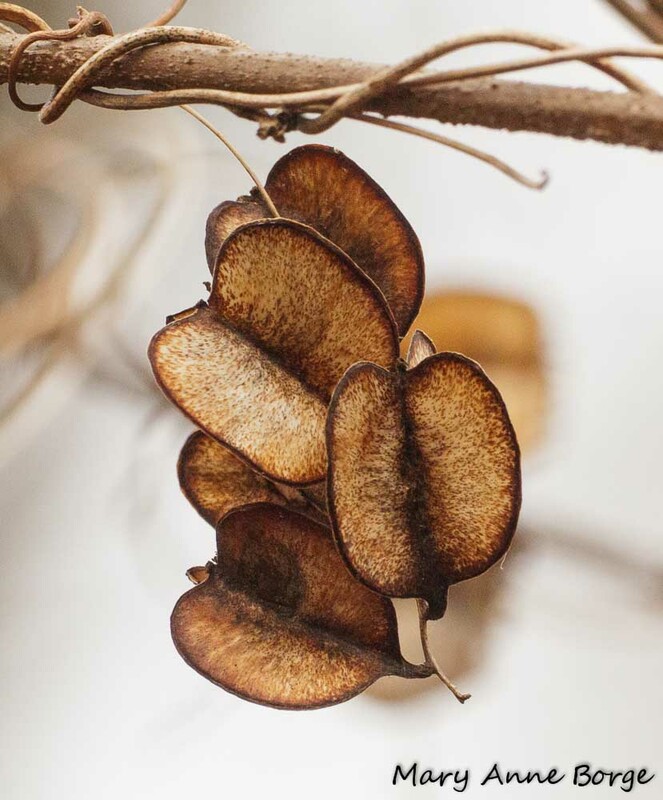 Almost luminous in the sunlight, hanging clusters of Wild Yam’s dried three-sided fruit capsules are eye-catching in winter. These fruits are opening now to release their winged seeds, a design well adapted for wind dispersal. Although it is related to the yams and sweet potatoes we eat, Wild Yam is not really edible. In fact, when consumed fresh, the underground rhizomes might make you nauseous or result in other unpleasant side effects. But prepared properly it does have medicinal uses. This unassuming looking plant is worth noting, because it has played an important role in modern drug development. The roots of Wild Yam contain chemicals called diosgenins, from which many steroid hormones, including contraceptives, were derived. These chemicals are components in medications used to treat ailments from asthma, arthritis and eczema to reproductive system problems and high blood pressure. Wild Yam is generally thought to help relieve pain, and to be an effective anti-spasmodic. Alternate common names are Colic-root or Rheumatism Root, after a few of its uses. Native Americans used tea made of Wild Yam root to relieve the pain of childbirth. 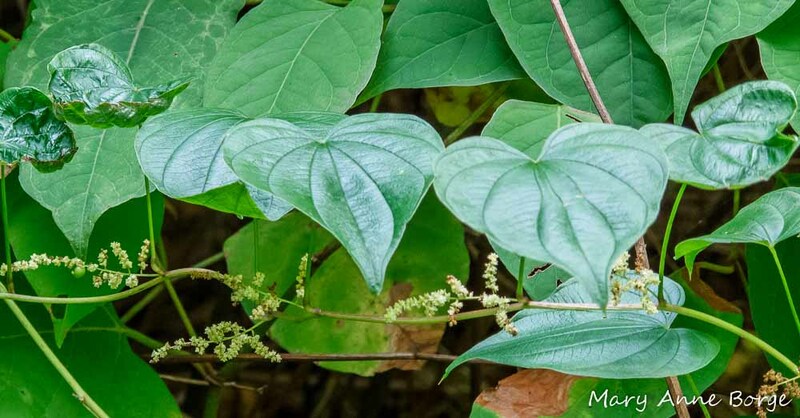 Wild Yam is insect pollinated, and provides cover and nesting habitat for birds. It is native in much of the eastern two-thirds of North America, from Ontario to Minnesota, Nebraska and Vermont, south to Texas in the west, Florida and even Puerto Rico in the east. Look for it in woodlands and thickets, climbing in the shrub layer. Foster, Stephen; Duke, James A. A Field Guide to Medicinal Plants and Herbs of Eastern and Central North America, Second Edition. 2000. Cech, Richo. American Wild Yam. From Planting the Future, Saving Our Medicinal Herbs, edited by Gladstar, Rosemary and Hirsch, Pamela. 2000. 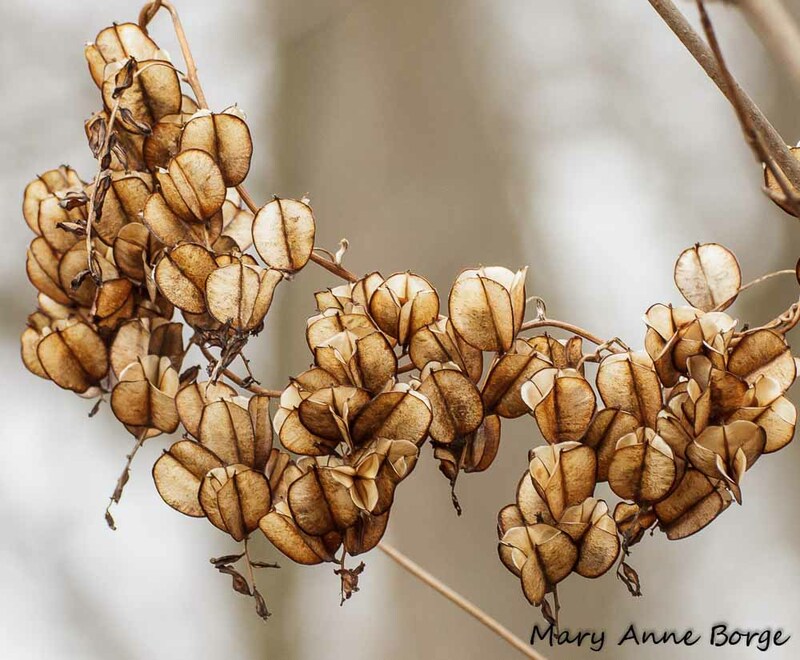 This entry was posted in Birds, Native Plants and tagged Abbott Marshlands, Dioscorea villosa, Medicinal Plants, nature, Wild Yam by Mary Anne Borge. Bookmark the permalink.